Why Is the Art of Communication Vital to Leadership? Have you ever wondered why even though there are plenty of leaders only a few create impact? All these leaders have a vision, they have strategies and plans, they have organisational backing, and they have followers too in plenty. But then why is it that only few create impact; while the rest are leaders only because they occupy a position? One way to look at the answer to these questions is to listen to someone who has watched leadership at close quarters. 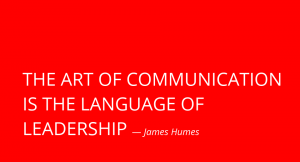 James C. Humes, who wrote speeches for five American Presidents, said, “The art of communication is the language of leadership.” When he says so, we are compelled to listen because he has seen these leaders communicate with power, authority, charisma, and also declare their international policies with inspiring thoughts and words. So the answer to the question why only few leaders create impact has to do more with communication than with any other characteristic of leadership. If at all a leader can move followers and make them rally behind him in a worthy cause; it is because primarily he is purposeful and decisive in speech and action. Leaders who impact are undoubtedly those who speak with a sense of purpose and direction. Beyond purpose, the next spear-head of leadership impact comes through clarity in communication. It comes from clarity of thinking. When it is coupled with an intense desire to make oneself understood by the audience the impact is tremendous. Achieving clarity, however, is no easy task. It comes from thinking through a situation in all its dimensions. If purpose and clarity has to create impact it has to ride on the confidence of a speaker. Some people bank heavily on knowledge of the subject to ensure confidence. But that is not the only thing that determines confidence. The primary thing is the conviction that he or she as a leader is conscious of the authority vested with him or her. Courage, firmness, resolve, and the will to get things done; all combine together when a leader speaks with confidence. Above all these, it is of supreme importance that leaders communicate with simplicity. Now that does not mean that a leader adopts the language level of a child to make oneself understood. That is not the point at all. The point is that in our world of communication overkill, there are too many messages competing for attention at the same time in the minds of audiences. It is in the midst of all these you need to find space and a listening ear. To do so, you need to use vivid, concrete, specific, image-building words and phrases and create symphony which is memorable, striking, and lasting. It is an art in itself. So let me stress four pillars of the art of communication that translates itself into the language of leadership. They are purpose, clarity, confidence, and simplicity. Well, One characteristic of the art of leadership communication cannot be left unmentioned. It is brevity. Often brevity is achieved by asking questions that penetrate into defences, tear open hidden agendas, elicit information that was missing, provoke thought, and silence critics. If you are a leader, can you lead with questions? If not, your language of leadership is missing a fine art. Too many words of explanation often dilute leadership messages. On the other hand economy of words strongly wedded to calmness indicate your authority and command. It also reflects your absolute confidence to inspire unswerving loyalty and instant obedience. If you look at the sports field, especially in team games like football and cricket; the body language of captains often exudes power when they are in absolute command of their men and situation. During those times, a slight movement in his face itself can align his team to his wishes. The art of communication in leadership finally boils down to this bold exercise of authority. Dr. A. P. J. Abdul Kalam–The Missile Man of India and Dreamer! Previous PostPrevious A Speech on My Favourite Hobby—Playing Cricket! Next PostNext So You’re Graduating!